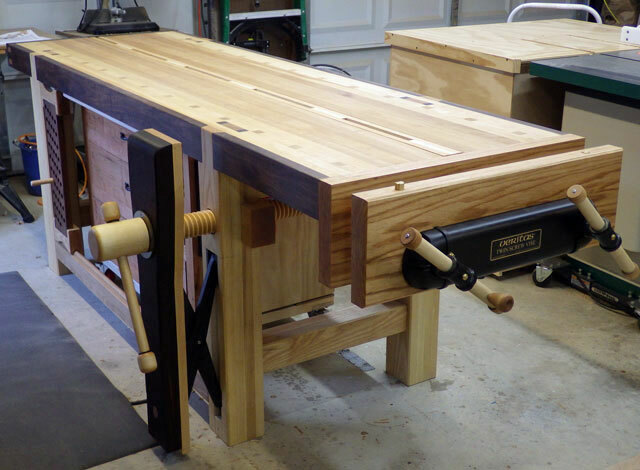 Our July 2014 Workbench comes to us from William B. from Cary, North Carolina. He has built a 500 pound Ash and Walnut hybrid split-top Roubo style bench. We know that you will all enjoy it as well as the additional detail link that we provide you below to the NC Woodworker Forum. I put together a description of the design and building decisions I made, and posted it at NCWOODWORKER It may be a bit too long and detailed, but it goes through some of the process I used to build the bench. The legs are about 4 ¾” x 4 ½”. 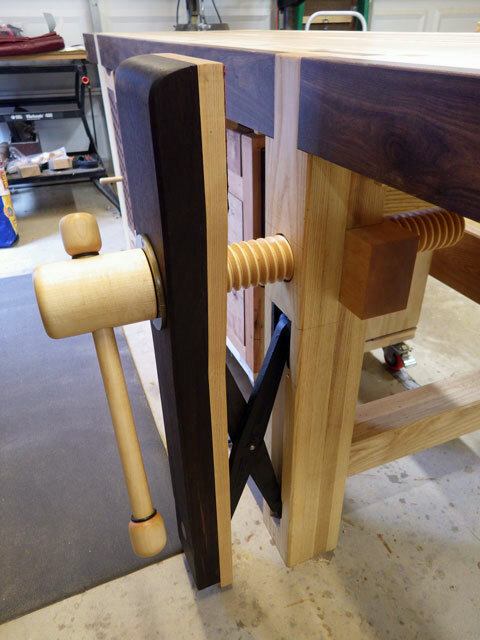 The top rests on 3 ½” x 3 ¾” cross pieces mortised into the legs. The bench must weigh something in the neighborhood of 500 pounds. I began with about 165 board feet of rough ash lumber, and about 15 board feet of walnut. Wood for the leg vise and the twin screw end vise are walnut and red oak, respectively. Wooden Vise Highlights Video, Check It Out!